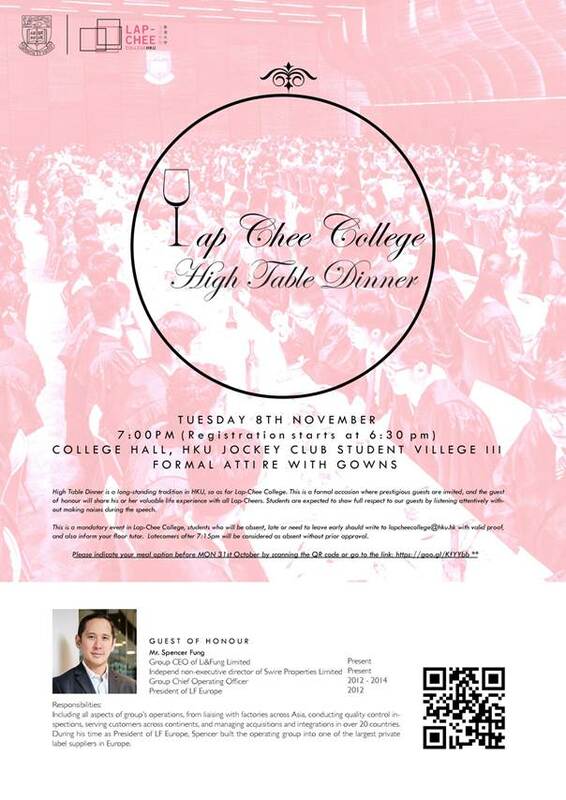 Please be reminded that the coming Lap-Chee College High Table will be held on Tuesday 8 November 2016. As this is a compulsory event in Lap-Chee College, students who will be absent, late or need to leave early due to classes should write to lapcheecollege@hku.hk with valid proof, and also inform your floor tutor before Monday, 31 October 2016. Formal attire with gowns. Students who do not dress according to this requirement will be asked to leave the College Hall and will be regarded as absence. Please sit according to the instructions from the Floor Management Team onsite. Please kindly fill in the form below to let us know your preference for the main course: https://goo.gl/KfYYbb before Monday, 31 October 2016.